Flatten bread with a rolling-pin. In a bowl, combine cream cheese and confectioners’ sugar. In another bowl, combine sugar and cinnamon; set aside. Spread about 1 tablespoon of cheese mixture on each slice of bread. Roll up, jelly roll style. Dip in melted butter, then in cinnamon-sugar. Place on an ungreased baking sheet. Combine sugar and cinnamon in a bowl. Spread 1-2 tablespoons of sweetened cream cheese on each slice of bread. Roll it up...jelly roll style. Serve this for brunch with poached eggs, or break into small pieces as a nibble with drinks. Put the bacon on a rack over a baking tray. Mix the syrup, sugar and mustard in a small bowl with a splash of water, then lightly brush over the bacon. Cook in the oven for 10 minutes, then turn and brush the other side and cook for another 10 minutes. Keep brushing and turning until the bacon looks glassy, crisp and caramelised – this will take another 5-10 minutes depending on the power of your oven. Keep a close eye on the bacon for the last few minutes of cooking, because the sugar can easily burn. Preheat oven to 375* F (190.5*C). In a large mixing bowl combine all the ingredients except the vegetable oil for cooking. Use your hands to form bite sized balls. Once browned, place the browned chicken balls onto a baking sheet and bake about 10-15 minutes or until done. In a medium mix combine cream cheese, cheddar cheese, and bacon bits. Spoon the mixture into each of the jalapeno pepper halves. In a small bowl add the milk, and in another small bowl add the flour. In a shallow pie dish add the breadcrumbs. Dip the jalapenos first in milk, then into the flour, ensuring that they are well coated. Allow to set for 10 minutes. Dip the jalapenos in the milk again, and then roll in breadcrumbs. In a deep fryer (or deep skillet) heat oil . Deep fry coated jalapenos in batches for 2 to 3 minutes until golden brown. Remove and drain on paper towels. Preheat oven to 200*F (400*F) rack in the middle. Gently separate the onion rings leaving 2 rings together (you want to double up on the onions when you wrap them). For this dish you want the larger rings. The smaller, inner rings you can set aside and use in another dish. Starting at one end of the bacon, snuggly but gently wrap the bacon around the onion ring slightly overlapping itself. You should be able to get half way around (again, depends on how big your rings are). Place end side down on the rack and continue wrapping the rest of the rings. For the smaller rings I used 1 1/2 slices of bacon. You really don’t want to overload this with bacon as you want the bacon to cook evenly. The last 3 minutes I broiled them as I wanted that charred appearance. Remove from the oven and immediately plate. They will be soft so be careful but the bacon will crisp up and they will become crispy crunchy. Cut onions into 1/2 inch thick rings and pop the internal rings out until you have a nice sturdy onion ring. 1 tsp of lime juice. Wrap a cocktail frankfurters in each square, brush with lightly beaten egg. Bake in hot oven, on baking paper lined oven tray, until pastry is golden brown. Mash avocado until smooth, add tomato, onion and coriander and serve! Heat the olive oil in a medium-sized saute pan over medium heat. Add the chopped garlic, jalapeño, and tahini and saute until the garlic is golden brown, about 4 minutes. Transfer the mixture to a blender or food processor. Add the remaining garlic clove, chickpeas, lemon juice, and salt. Puree the mixture until smooth, then use a spoon to fold in the parsley. Use a rubber spatula to transfer the hummus to a serving bowl, and serve immediately. This hummus can be stored, covered, and chilled for up to 1 week. 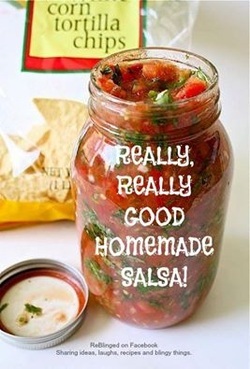 (Once you taste this recipe, you'll never buy salsa again)! Combine the cream, sour cream and onion in a medium saucepan over low heat. Bring to a gentle simmer. Remove from heat and stir in the cheddar and parmesan. Place the pan over low heat. Cook, stirring, for 1 minute or until the cheese almost melts. Stir in the artichoke and spinach and cook, stirring, for 1-2 minutes or until warmed through. Season with salt and pepper and top with Tabasco. Serve with corn chips.